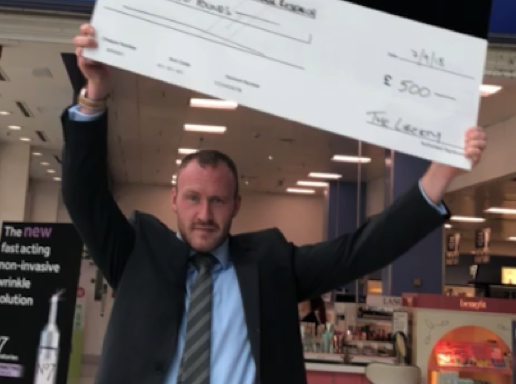 The Liberty Shopping Centre’s very own manager, Janis Labutis has triumphed over thousands of local entrants to win £500 for local charity Haven House Children’s Hospice and Cancer Research UK. Janis Labutis from Aveley, South Ockendon successfully completed the centre’s ‘Wild Slyde’ sporting challenge in just 4.85 seconds, and keeping his victory record title by beating his first record-breaking attempt that he set in 2015. ‘Wild Slyde’, created by Weininger Irwin, the UK’s first ‘Gladiators’ champion, returned to the shopping centre to round off the ‘Summer Celebrations’ activity based in the centre, to entertain both kids and adults over the summer holidays. Since setting the ‘WRS’ record three years ago, owner of the Wild Slyde, Weininger has been looking for someone to beat Janis’s show-stopping time. Janis has worked at The Liberty shopping centre for eight years as Soft Services Manager and will donate his £500 deserving prize to The Liberty’s two chosen charities, Haven House Children’s Hospice and Cancer Research UK. The shopping centre invited shoppers, charities and local businesses to take part in the impact-free sport, for the chance to win the donation. Jonathan Poole, Centre Manager at The Liberty, commented: “It has been a great summer of celebrations at The Liberty. Janis Labutis, winner of ‘Wild Slyde’ said: “I’m incredibly happy to win the Wild Slyde competition surrounded by staff from The Liberty and beat my record title. Weininger Irwin, creator of WRS Resistance Sliding, aka Wild Slyde added: “Year after year I am incredibly surprised by Janis’s tremendous attempts at The Liberty’s Wild Slyde competition. His dedication and determination to improve upon his record time is inspiring, especially as it’s for such a worthy cause. “Since achieving a record time in 2015, Janis has tried to beat his own record every year since, this year achieving his dream with an astonishing 4.85 second victory which I am very proud of”.